"Recurrent nerve" redirects here. For the supply to the thenar eminence, see recurrent branch of the median nerve. The recurrent laryngeal nerve (RLN) is a branch of the vagus nerve (cranial nerve X) that supplies all the intrinsic muscles of the larynx, with the exception of the cricothyroid muscles. There are two recurrent laryngeal nerves, right and left, in the human body. The right and left nerves are not symmetrical, with the left nerve looping under the aortic arch, and the right nerve looping under the right subclavian artery then traveling upwards. They both travel alongside of the trachea. Additionally, the nerves are one of few nerves that follow a recurrent course, moving in the opposite direction to the nerve they branch from, a fact from which they gain their name. 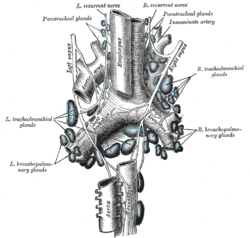 Posterior view of tracheal and bronchial lymph glands, with the left and right recurrent nerves visible on either side. 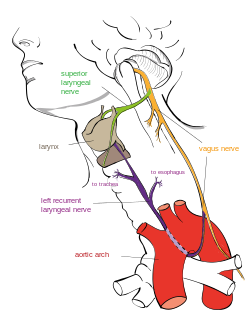 The recurrent laryngeal nerves supply sensation to the larynx below the vocal cords, gives cardiac branches to the deep cardiac plexus, and branches to the trachea, esophagus and the inferior constrictor muscles. The posterior cricoarytenoid muscles, the only muscles that can open the vocal cords, are innervated by this nerve. The recurrent laryngeal nerves are the nerves of the sixth pharyngeal arch. The existence of the recurrent laryngeal nerve was first documented by the physician Galen. Passing under the subclavian artery, the right recurrent laryngeal nerve has a much shorter course than the left which passes under the aortic arch and ligamentum arteriosum. The somatic motor fibers that innervate the laryngeal and pharyngeal muscles are located in the nucleus ambiguus and emerge from the medulla in the cranial root of the accessory nerve. Fibers cross over to and join the vagus nerve in the jugular foramen. :86–88 Sensory cell bodies are located in the inferior jugular ganglion, and the fibers terminate in the solitary nucleus. :86–88 Parasympathetic fibers to segments of the trachea and esophagus in the neck originate in the dorsal nucleus of the vagus nerve. In about four people out of five, there is a connecting branch between the inferior laryngeal nerve, a branch of the RLN, and the internal laryngeal nerve, a branch of the superior laryngeal nerve. This is commonly called the anastomosis of Galen (Latin: ansa galeni), even though anastomosis usually refers to a blood vessel,:35 and is one of several documented anastomoses between the two nerves. 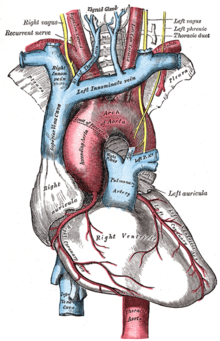 As the recurrent nerve hooks around the subclavian artery or aorta, it gives off several branches. There is suspected variability in the configuration of these branches to the cardiac plexus, trachea, esophagus and inferior pharyngeal constrictor muscle. The recurrent laryngeal nerves control all intrinsic muscles of the larynx except for the cricothyroid muscle. [a] These muscles act to open, close, and adjust the tension of the vocal cords, and include the posterior cricoarytenoid muscles, the only muscle to open the vocal cords. :10–11 The nerves supply muscles on the same side of the body, with the exception of the interarytenoid muscle, which is innervated from both sides. The nerve receives close attention from surgeons since during neck surgery, especially thyroid and parathyroid surgery, the nerve is at risk for injury. Nerve damage can be assessed by laryngoscopy, during which a stroboscopic light confirms the absence of movement in the affected side of the vocal cords. The right recurrent laryngeal nerve is more susceptible to damage during thyroid surgery because it is close to the bifurcation of the right inferior thyroid artery, variably passing in front of, behind, or between the branches. :820–1 The nerve is permanently damaged in 0.3–3% of thyroid surgery, and transiently in 3–8% of surgeries, and is one of the leading causes of medicolegal issues for surgeons. The RLN may be compressed by tumors. Studies have shown that 2–18% of lung cancer patients develop hoarseness because of recurrent laryngeal nerve compression, usually left-sided. This is associated with worse outcomes, and when found as a presenting symptom, often indicates inoperable tumors. 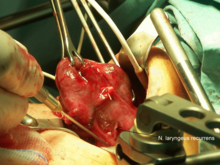 The nerve may be severed intentionally during lung cancer surgery in order to fully remove a tumor. :330 The RLN may also be damaged by tumors in the neck, especially with malignant lymph nodes with extra-capsular extension of tumor beyond the capsule of the nodes, which may invade the area that carries the ascending nerve on the right or left. In Ortner's syndrome or cardiovocal syndrome, a rare cause of left recurrent laryngeal nerve palsy, expansion of structures within the heart or major blood vessels impinges upon the nerve, causing symptoms of unilateral nerve injury. In sauropod dinosaurs, the vertebrates with the longest necks, the total length of the vagus nerve and recurrent laryngeal nerve would have been up to 28 metres (92 ft) long in Supersaurus, but these would not be the longest neurons that ever existed: the neurons reaching the tip of the tail would have exceeded 30 metres (98 ft). Roman physician Galen demonstrated the nerve course and the clinical syndrome of recurrent laryngeal nerve paralysis, noting that pigs with the nerve severed were unable to squeal. Galen named the nerve the recurrent nerve, and described the same effect in two human infants who had undergone surgery for goiter. :7–8 In 1838, five years before he would introduce the concept of homology to biology, anatomist Richard Owen reported upon the dissection of three giraffes, including a description of the full course of the left recurrent laryngeal nerve. Anatomists Andreas Vesalius and Thomas Willis described the nerve in what is now regarded as an anatomically standard description, and doctor Frank Lahey documented a way for its interoperative identification during thyroid operations. ^ "Recur". Free Dictionary. Merriam-Webster. Retrieved March 1, 2013. ^ "Recurrent". Medical definition and more. Merriam-Webster. Retrieved March 1, 2013. ^ a b c F. Charles Brunicardi; F. Brunicardi; Dana Andersen; E. Pollock Raphael; Timothy Billiar; David Dunn; John Hunter; Jeffrey Matthews; Raphael E. Pollock (September 11, 2009). Schwartz's Principles of Surgery (9th ed.). McGraw Hill Professional. ISBN 978-0-07-154769-7. ^ Agur, A. M. R.; Dalley, Arthur F. (2009). Grant's Atlas of Anatomy. Lippincott Williams & Wilkins. p. 770. ISBN 978-0-7817-7055-2. ^ Ross, Lawrence M.; Lamperti, Edward D. (2006). Thieme Atlas of Anatomy: Neck and Internal Organs. Thieme. ISBN 978-1-58890-443-0. ^ Aronson, Arnold Elvin (2009). Clinical Voice Disorders. Thieme. p. 74. ISBN 978-1-58890-662-5. ^ a b c Schulte, Erik; Schumacher, Udo; Rude, Jürgen (2007). Thieme Atlas of Anatomy: Head and Neuroanatomy. Thieme. ISBN 978-1-58890-441-6. ^ a b Alberstone, Cary D. (2009). Anatomic Basis of Neurologic Diagnosis. Thieme. pp. 260–261. ISBN 978-0-86577-976-1. ^ a b c Larsen, William J. (1993). Human embryology. Churchill Livingstone. ISBN 0-443-08724-5. Retrieved February 26, 2013. ^ Quan-Yang Duh; Orlo H. Clark; Electron Kebebew (October 14, 2009). Atlas of Endocrine Surgical Techniques. Elsevier Health Sciences. ISBN 978-1-4160-4844-2. Retrieved March 6, 2013. ^ Naidu, L.; Ramsaroop, L.; Partab, P.; Satyapal, K. S. (2012). "Galen's "Anastomosis" revisited". Clinical Anatomy. 25 (6): 722–728. doi:10.1002/ca.22011. PMID 22162120. ^ Langmore, Susan E. (January 2001). Endoscopic Evaluation and Treatment of Swallowing Disorders. Thieme. ISBN 978-0-86577-838-2. ^ Sañudo, Jose-Ramón; Maranillo, Eva; León, Xavier; Mirapeix, Rosa-María; Orús, Cesar; Quer, Miquel (June 1999). "An anatomical study of anastomoses between the laryngeal nerves". The Laryngoscope. 109 (6): 983–987. doi:10.1097/00005537-199906000-00026. PMID 10369294. ^ a b c d e Hydman, Jonas (2008). Recurrent laryngeal nerve injury. Stockholm. ISBN 978-91-7409-123-6. ^ Hartl, D. M.; Travagli, Jean-Paul; Leboulleux, Sophie; Baudin, Eric; Brasnu, Daniel F.; Schlumberger, Martin (2005). "Current Concepts in the Management of Unilateral Recurrent Laryngeal Nerve Paralysis after Thyroid Surgery". Journal of Clinical Endocrinology & Metabolism. 90 (5): 3084–3088. doi:10.1210/jc.2004-2533. ISSN 0021-972X. ^ Hayward, Nathan James; Grodski, Simon; Yeung, Meei; Johnson, William R.; Serpell, Jonathan (January 2013). "Recurrent laryngeal nerve injury in thyroid surgery: a review". ANZ Journal of Surgery. 83 (1–2): 15–21. doi:10.1111/j.1445-2197.2012.06247.x. ^ Spiro, Stephen G. (2007). "Initial Evaluation of the Patient With Lung Cancer: Symptoms, Signs, Laboratory Tests, and Paraneoplastic Syndromes: ACCP Evidenced-Based Clinical Practice Guidelines (2nd Edition)". Chest. 132 (3_suppl): 149S. doi:10.1378/chest.07-1358. ISSN 0012-3692. ^ David P. Carbone; Harvey I. Pass; David H. Johnson; John D. Minna (2010). Principles and Practice of Lung Cancer: The Official Reference Text of the IASLC. Lippincott Williams & Wilkins. ISBN 978-0-7817-7365-2. Retrieved August 12, 2013. ^ Heikkinen, Jaakko; Milger, Katrin; Alejandre-Lafont, Enrique; Woitzik, Christian; Litzlbauer, Detlef; Vogt, Julia-Franziska; Klußmann, Jens Peter; Ghofrani, Ardeschir; Krombach, Gabriele A.; Tiede, Henning (2012). "Cardiovocal Syndrome (Ortner's Syndrome) Associated with Chronic Thromboembolic Pulmonary Hypertension and Giant Pulmonary Artery Aneurysm: Case Report and Review of the Literature". Case Reports in Medicine. 2012: 1–5. doi:10.1155/2012/230736. ISSN 1687-9627. PMID 23424588. ^ Munroe, Graham; Weese, Scott (March 15, 2011). Equine Clinical Medicine, Surgery and Reproduction. Manson Publishing. ISBN 978-1-84076-608-0. Retrieved March 2, 2013. ^ Slatter, Douglas H. (2003). Textbook of Small Animal Surgery. Elsevier Health Sciences. ISBN 978-0-7216-8607-3. Retrieved March 2, 2013. ^ Wedel, Mathew J. (June 2012). "A Monument of Inefficiency: The Presumed Course of the Recurrent Laryngeal Nerve in Sauropod Dinosaurs". Acta Palaeontologica Polonica. 57 (2): 251–256. doi:10.4202/app.2011.0019. ^ Mammal Anatomy: An Illustrated Guide. Marshall Cavendish Corporation. 2010. ISBN 0-7614-7882-5. ^ Dawkins, Richard (2009). "11. History Written All Over Us". The Greatest Show on Earth. New York: Free Press. ISBN 978-1-4165-9478-9. Retrieved November 21, 2009. ^ Gross, Charles G. (May 1998). "Galen and the Squealing Pig". Neuroscientist. 4 (3): 216–221. doi:10.1177/107385849800400317. ISSN 1073-8584. ^ Robert James Berry; Anthony Hallam (1986). The Collins Encyclopedia of Animal Evolution. HarperCollins Publishers Limited. pp. 82–83. ISBN 978-0-00-219818-9. Retrieved February 27, 2013. ^ Ardito, Guglielmo; Revelli, Luca; D'Alatri, Lucia; Lerro, Valentina; Guidi, Maria Lavinia; Ardito, Francesco (February 2004). "Revisited anatomy of the recurrent laryngeal nerves". The American Journal of Surgery. 187 (2): 249–253. doi:10.1016/j.amjsurg.2003.11.001.